by Chris Woodford. Last updated: September 28, 2018. If your bicycle is fitted with a dynamo (a small electricity generator that drives your front and back lamps from the back wheel), you'll know it's harder to pedal when the lights are on than when they're off. That's because the energy you need to make the lights come on has to come from your legs. The faster you pedal, the quicker the dynamo turns and the brighter your lamps shine (up to a point, anyway). So how bright your lamps are shining is a crude measurement of how fast you're pedaling and how much force you're producing with your legs. Now suppose you wanted to measure how much power something like a car engine could make. You could do it using a bigger version of a bicycle dynamo, with some sort of a meter in place of the lights to give you an accurate reading. Machines that measure force, power, or speed in this way are called dynamometers. Let's take a closer look at how they work! Photo: Testing, testing! The giant driving dynamometer (top) is turning a wind turbine generator and drive train (bottom) to simulate how well they would work in extreme wind conditions. If you can't figure out what's happening here, imagine a large electric motor and generator coupled together by a sturdy metal rod—and that's pretty much what you can see. Photo by Warren Gretz courtesy of US Department of Energy/National Renewable Energy Laboratory (US DOE/NREL). A dynamometer is a device that can measure force, power, or speed—so you can figure out how much power you need or how much you have to hand. But dynamometers come in all shapes and sizes. A spring dynamometer is just about the simplest kind you can imagine: it's a sturdy metal spring on a two-part mounting. You anchor one end, attach the other end to the force you're trying to measure, and read the size of the force off a scale. This kind of spring dynamometer is almost identical to a spring balance. The only difference is in calibration: a spring balance has its scale marked in units of weight (such as kg), while a spring dynamometer is calibrated in units of force (such as newtons). While a spring dynamometer can measure a simple pulling force, it's no good for measuring something like the turning force of an engine or the power of a machine. So how can we do that? Photo: A spring dynamometer. The grey line you see in the middle is a sturdy spring attached to the red sliding part (at one end) and the grey fixed part (at the other). The more force I apply to the red part, the more the spring stretches. A pointer on the red sliding part indicates the size of the force on the scale. If you've got something like a giant factory machine made up of levers, gears, drive belts, and other bits and pieces, and you want to know how big an engine or electric motor you'd need to make it work, you can use a machine called a driving dynamometer. It's essentially just an ordinary engine or an electric motor with some appropriate measuring meters or monitors attached so you know how much power, force, or speed is being used at any given moment. If you've got an engine or motor, you can use a different kind of dynamometer to measure how much torque (turning force), power, or speed it can produce. Here, the dynamometer acts as a variable load that the engine/motor drives. It works by soaking up or absorbing the power that the engine/motor produces, so it's called an absorption dynamometer. An absorption dynamometer is a bit more sophisticated and interesting than a driving dynamometer. If you think about it, it needs a way of soaking up and dissipating potentially a huge amount of power, and there are all kinds of different ways to do this. One easy way is to use electromagnetism. If you wanted to test out the power of an electric motor, you could connect its driving axle up to the axle of a generator. As the motor spins around, it would make the generator spin too, producing an electric current proportional to the motor's power; measure the generator current and you have an indication of how powerful the motor is. 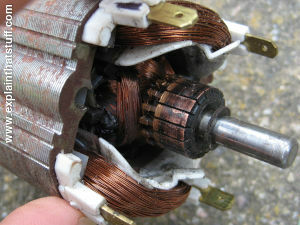 Photo: An electric motor and a generator are essentially the same device working in exactly opposite ways. An electric motor can work as a driving dynamometer; an electric generator can work as an absorption dyanamometer. A car speedometer is a different kind of dynamometer that uses electromagnetism. A spinning metal disc connected by a cable to the car's wheels makes a magnet rotate inside a metal cup. As the magnet rotates, it generates eddy currents (a kind of opposing electromagnetism) in the cup that try to slow the magnet down. The cup starts to rotate and that makes a pointer (the speedometer needle) turn up a dial. Not all dynamometers use electromagnetism. Fluid dynamometers work like water turbines: as you spin their axles, you turn a paddle inside a drum filled with water (or thick oil). That provides the resistance and load, and the power produced by an engine, motor, or other machine under test is dissipated by the water or oil heating up as the paddle turns. Other kinds of dynamometers use hydraulic pistons or friction to dissipate power. Artwork: How a fluid-type absorption dynamometer works. This one was developed by Boeing for measuring the power of jet engines, and reads from right to left. Air from the engine (light blue) enters the pipes from the right and makes the vaned wheel (red) spin around. That spins a central dynamometer shaft (gray), turning a paddle wheel (yellow) at the opposite end. The paddle wheel, which is a bit like a water turbine, spins through a constant flow of water (darker blue), which absorbs its kinetic energy in the form of heat. On the left hand side, gears (purple) connect the dynamometer shaft to something like a paper trace (green) that measures and records the force. From US Patent 2,689,476: Fluid dynamometer by Vern W. Van Ornum, Boeing, September 21, 1954. Artwork courtesy of US Patent and Trademark Office. Some dynamometers can work in either absorption or driving mode. An electric motor is a good example: feed electricity into it and it can drive another machine; turn its axle using another motor, engine, or machine and it will spin in reverse, producing a measurable electric current like an electricity generator. Instruments that work in both ways (driving and absorption) are sometimes called universal dynamometers. Photo: Testing a car with a chassis dynamometer. 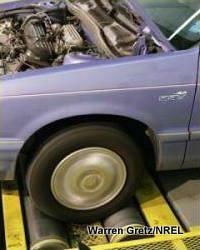 This absorption (chassis) dynamometer measures the power of a car's gasoline engine. It consists of heavy metal rollers that spin round when the car's wheels turn, absorbing the power. Photo by Warren Gretz courtesy of US Department of Energy/National Renewable Energy Laboratory (US DOE/NREL). If you've ever set foot in a garage, you'll have noticed some metal rollers on the ground (or on a movable stand) onto which cars and trucks can be driven for testing their engines. Once the vehicle is in place, brakes on the rollers are disengaged. Now when the vehicle engine starts turning its wheels, the rollers turn too but the vehicle remains stationary. The rollers are actually very heavy metal drums connected up to sophisticated electronic measuring instruments that figure out how much torque, horsepower, or speed the engine is capable of producing by measuring how fast the drums take to accelerate. A device like this is called a chassis dynamometer. It's a type of absorption dynamometer that uses the drums' heavy inertia to soak up the car engine's power. From everything I've said so far, you might be forgiven for thinking that dynamometers are machines used only for testing other machines, but they also have at least one more useful job: helping to measure the strength of the human body. Doctors, for example, use dynamometers to measure the force that a person's muscles can exert, which is helpful in diagnosing illness or figuring out how successfully treatments are progressing. One very common example is the hand-grip dynamometer; it has a trigger or bulb you squeeze with one hand and shows the force you exert on a dial or digital display. 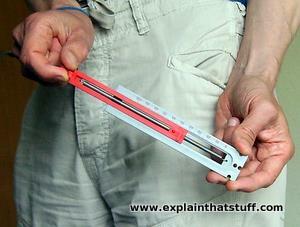 Artwork: A typical hand-held dynamometer for measuring the grip strength of hand muscles. You squeeze the purple bulb and a fluid flows up the green shaft, forcing the pointer on top round a calibrated scale. In this case, the dial is measuring the fluid pressure created by force from your hand. 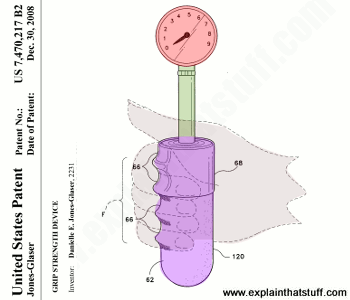 From US Patent 7,470,217: Grip strength device by Danielle E. Jones-Glaser, December 30, 2008, courtesy of US Patent and Trademark Office. 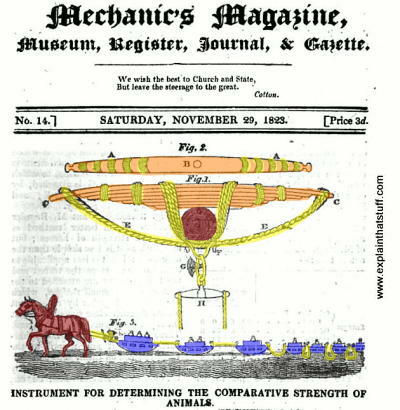 Artwork: "Instrument for determining the comparative strength of animals," from Mechanic's Magazine, Saturday November 29, 1823. Artwork courtesy of Google Books (follow this link to read an entertaining description of how M. Regnier used his dynamometer to compare the strength of Englishmen, Frenchmen, and "savages"). Electromagnets, electronics, computers—dynamometers are sophisticated, high-tech instruments, and you might conclude that they're a relatively recent invention. But people have needed to measure force for hundreds (if not thousands) of years. If you were an army general during the early-19th-century Napoleonic wars, for example, you might have wanted to pick out your strongest horses to pull your cannons into battle. So how would you have done it? You'd have used a dynamometer! But not like the ones I've described up above. The first dynamometers were entirely mechanical contraptions. Probably the earliest was invented in 1763 by a Londoner called Graham and improved by Desagulier and measured force using levers and weights. The artwork you can see here, from an 1823 issue of Mechanic's Magazine, shows two other kinds of dynamometers. The top two figures show a crude version of an instrument called a Regnier dynamometer, which was invented in Paris in 1798. The upper figure is a view from behind; the middle figure shows you the structure of the dynamometer viewed from above. This one is made from a number of wooden struts (orange) fastened together and attached to a tree (brown circle). When you pull on the rope (yellow), you bend the struts. The amount by which the struts bend gives you a reasonable idea of the force applied. You don't get a numeric measurement, of course, but you could certainly use something like this to compare the pulling power of two horses. More sophisticated versions had two steels springs that you pulled apart like the string of a bow; bending the springs made a pointer move up a dial, which indicated the force you applied. The bottom figure shows an even simpler dynamometer. Simply load up a few sledges with weights (it doesn't really matter how heavy each sledge is) and get your horses to try pulling them. The animal that pulls the most sledges is the strongest. 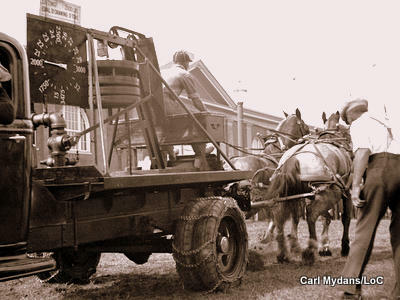 That's the simplest dynamometer of all—and it gives a whole new meaning to "hold your horses"! Photo: Hold your horses: A truck-mounted dynamometer being used to judge a horse-pulling contest at Eastern States Fair, Springfield, Massachusetts in 1936. Note the dial meter on the back of the truck and the chains on the tires for added grip. Photo by Carl Mydans, US Farm Security Administration/Office of War Information, courtesy of US Library of Congress. Dynamometer: Theory and Application to Engine Testing by Jyotindra S. Killedar. Xlibris Corporation, 2012. A comprehensive guide to the many kinds of engine-testing dynamometers. Mechanical measurements by Thomas G. Beckwith, Roy D. Marangoni, and John H. Lienhard. Pearson Prentice Hall, 2008. Includes a short section on mechanical, hydraulic, and electric dynamometers. Dyno Testing and Tuning by Harold Bettes and Bill Hancock. CarTech Books, 2008. Explains how to tune your car with a dynamometer. Early Dynamometry and Dynamometers by Dr. Arieh N. Gilai. A great account of Graham-Desagulier, Regnier, and other early dynamometers and how they were used. US Patent 212,728: Improvement in rotary dynamometers by François Morin and Raymond Seillière, February 25, 1879. A simple rotary spring dynamometer. US Patent 667,920: Bicycle-dynamometer by Charles Perkins, February 12, 1901. An ingenious mechanical dynamometer that uses a lever arrangement to measure the force of a cyclist's leg, which is recorded in "real time" using a pencil and paper tape. 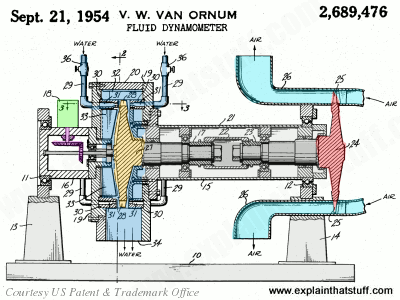 US Patent 2,689,476: Fluid dynamometer by Vern W. Van Ornum, Boeing, September 21, 1954. An absorption dynamometer for testing jet engines, which uses a fluid-filled chamber (a bit like a water turbine) to absorb huge amounts of energy. US Patent 4,077,255: Roller-type chassis dynamometer by Tadao Murakami, Hitachi, March 7, 1978. Describes in detail how a rolling-road chassis dynamometer measures torque electromagnetically.